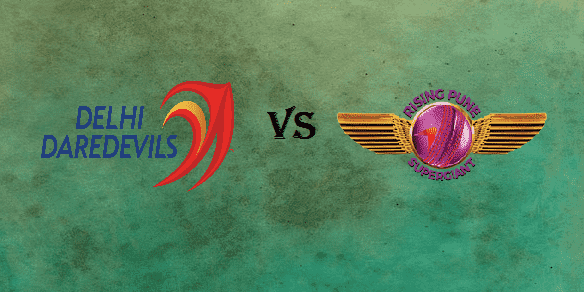 Feroz Shah Kotla, Delhi will host the 53rd match of Indian Premier League (IPL) 2017 which will be played between Delhi Daredevils (DD) and Rising Pune Supergiant (RPS) on 12th May. Temperature will be 35+ C during the match time and dew will be important factor; captains will like to chase. Delhi Daredevils had been ruled out of IPL 2017, before that they have two matches left that have to be played at home. They had won three matches in their last four matches. They had won last match against Gujarat Lions, where the team showed strength in both bowling and batting. Delhi Daredevils will like to win both the matches and finish the tournament on good note. Rishabh Pant is injured (thumb injury) and will not play the match. Rising Pune Supergiant is at the third in the points table with 16 points in 12 matches. RPS spot in playoffs is still not fixed as Kings XI Punjab had made it competitive at the end of the tournament. Rising Pune Supergiant had to win one more game in the two left or just wait for Kings XI Punjab to lose one remaining match. RPS are in great momentum and won last four matches if broadly say it, they had seven matches in last eight matches. RPS would like to maintain their winning combination. When the last encountered in IPL 2017, Delhi Daredevils defeated Rising Pune Supergiant with 97 runs. But now the scenario had change and RPS will be dominant over DD. They had overall 3 encounters out of which RPS had won 2 and DD had won one.